The purebred Friesian originated in Friesland, a province in the Netherlands. The Friesian is most recognized by its upright, noble carriage, its black hair coat, its long thick mane, tail and forelock, and the trademark feathers on its lower legs. Although the breed’s conformation resembles that of a light draft horse, the Friesian is remarkably nimble and graceful for its size, and carries itself with distinctive animation and elegance. Ranging in height from 15.1 to 17.3 hands and possessing a powerfully built body with dense bone, the Friesian horse is known for its brisk, high-stepping trot. During the Middle Ages, it is believed that the modern Friesian’s ancestors were highly prized as war horses, and because of their size and body type, could easily carry a knight in full armor into battle. Additionally, the Friesian became widely popular in Europe as a carriage horse. Although there is some documentation that the Friesian horse was first introduced to North America by way of the Dutch colony New Amsterdam in 1625, and was perhaps responsible for influencing a number of breeds developed in what would eventually become the United States, it seems that the Friesian horse ceased to exist in the colonies by 1664. It was not until 1974 that the purebred Friesian would be re-introduced to North America as a modern show horse, pleasure mount and parade and exhibition horse. Today the breed can be found competing in virtually every discipline. Still a favorite for carriage driving because of its beauty and powerful trot, the Friesian is making its presence felt in the dressage world in recent years, as well. Saddle Seat, Hunter Seat and Western riders have all found the Friesian a match in their respective classes. As to the driving disciplines, the Friesian has not merely retained its place, but expanded it, finding its way into pleasure driving, as well as combined driving. 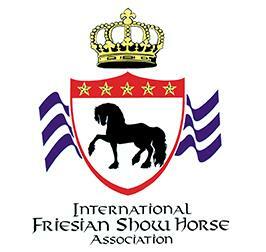 In 2001, the International Friesian Show Horse Association (IFSHA), was created and dedicated to the promotion, showing and exhibition of the Friesian Horse and its derivatives. Our sole purpose is to provide a USEF-rated show circuit for the Friesian horse. Each year IFSHA will hold rated, regional and Grand National competitions where we will reward Regional and Grand National Champions. Every horse with Friesian blood should be able to connect with and preserve their authentic Dutch heritage. IFSHA intends to reach out to all people with Friesian-bred horses and bring them together to protect, promote and establish a harmonious show community. USEF has added an additional type of show called Competition Lite. This new structure was created to provide another avenue for competitions to be licensed with US Equestrian while experiencing a modified application of some of the rules. How to hold breed-restricted competitions with open Dressage and Western Dressage classes in accordance with the rules.